The Kernel Brewery has gone from 0-100 in 2010. Making beer from a small lock-up in the arches under a railway bridge, Evin is like a wizard filling his bottles with beery magic potions. A series of pale ales, IPAs and a number of dark beers, plus a few cool collaboration (Glyn from The Rake, Mark from DarkStar, Coffee IPA with Square Mile Coffee, a behemoth imperial stout) sees a great range of great beers, all with unrivalled drinkability and oomph. I know I’ll be looking out for each new beer with thirsty anticipation in 2011. My second choice is another London brewery... Fuller’s. I haven’t had a Fuller’s beer all year that’s been less than excellent and a couple of Chiswicks have been mindblowingly good. 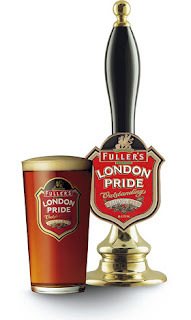 The reason I think Fuller’s are important in 2011 is that they have a huge breadth of coverage and they can appeal to the full spectrum of beer drinkers; their core range is very good and deliciously reliable, they have Vintages and Brewers Reserves, plus they are experimenting with the Past Masters series. They also have an important place in being approachable to those who don’t drink real ale and can definitely be a Road to Damascus brewery for new drinkers, whether through their excellent bottled beers or their cask range. They are for Beer Geeks too, who can happily fall back on a pint of Pride, they can look out with anticipation for the rarer casks of Porter, smack chops at Bengal Lancer, chill out with a Chiswick or get excited about the latest Vintage or Brewers Reserve. It’s a very strong brand for all drinkers, backed up with excellent beers. I think Adnams are also deserving of significant mention along with Fuller's in the way they can appeal to a very broad spectrum of drinkers, from the pint of best bitter in the pub to the home drinker in search of something special and rare, plus their interesting range of international beers and seasonals for those after a little variety. Add to this their new range of spirits and they are a brewery to look out for over the next year. Fuller's and Adnams could be the most important breweries in the UK right now. 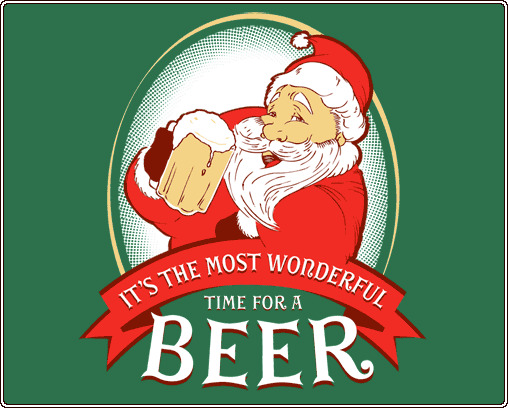 Who are you most looking forward to drinking this year? Who should people be looking out for? Did you get anything good for Christmas? Someone asked. I got some great new knives. He replied. Then, from behind, a giant character rose. You like knives, he asked. Shaved head, long chinstrap beard, tattoos, he reached into his pocket as we all watched in silence. This is a knife, he said with an aggressive Scottish accent, removing a flick knife, opening it and presenting it to the table. Silence. How do you reply to that? Nice, I think someone said. You said you like knives, I heard you say about knives so I though you liked them. What knife did you get, he asked. Oh, you said knives so I thought you meant real knives. A pause before: I’ve got rifle with a blade on the end. He then demonstrated how you’d kill and gut someone simultaneously. You can’t chop carrots with that, one of us said. No, you can, he said, before showing how. No, it’s just you said knives so I thought you liked knives, he said as he took his pocket flick knife back and put it in his pocket. I like knives, he said. He left the pub soon after and returned 20 minutes later with a guitar and amp and started playing. Bear in mind that in this pub was him, his partner, the barmaid and us. And we certainly didn’t want to hear him play. Especially not with an amp. But then we weren’t going to argue with him, were we. The most memorable beer weekend from this year was the one I spent in Prague and Pilsen. It was my introduction to lagers; it was me discovering just how good beer could be. I’ll never forget that first pint when we arrived in Prague; the beer from Pivovar Groll which is brewed in the heavy shadow of Pilsner Urquell; the unfiltered pilsner in the cellars under the city, and so many other golden pints with rocky white heads. It’s left me craving the beers ever since. I arrived home on Christmas Eve to find two bottles of Monsieur Rock, a collaboration between Stuart Howe at Sharp’s Brewery and Jean-Marie Rock from Orval, which is the unlikeliest of dream brewing teams. The beer is 5.2%, fermented with a lager yeast and dry-hopped with Saaz for two months of cold maturation in a lagering tank. And having followed the progression of the beer on Stuart’s blog, this was the best of early Christmas presents. 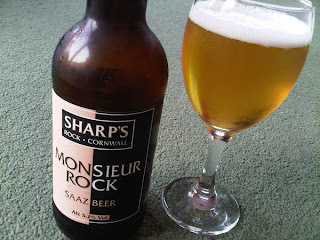 Monsieur Rock is as good as any lager I’ve had this year – as good as any beer I’ve had. It may very well be the best beer of the last turn around the sun. Every mouthful had me in suspense, in excitement, in awe, in love. Saaz hops are wonderful, beautiful things and in this they come together to create a masterpiece. It’s got the subtle olfactory shadow of a fruit bowl in it, orange peel, ripe peaches, tangerine, something floral and fresh like a spring morning (cut grass, blossom, a herb garden awakening, sunshine). There’s a playful bitterness – the perfect amount to make you go straight back for more – and it’s so smooth and clean and damn drinkable; the flavours aren’t squashed against one another and fighting for attention. This beer rocks. The joy of lager is the simplicity of it and a good one should make you want to drink pint after pint while talking with friends. But scratch beneath the simplicity and you get, if you want to find it, an amazing depth of flavour; a lesson in subtlety that leaves you chasing the come-get-me complexities around the glass. Why could it be the best beer I’ve had this year? “It’s one of those beers which it almost physically hurts to stop drinking,” says the ever-modest Stuart. Zak Avery says something similar: the beer skips across the palate “in a manner that made you think 'hang on, did that really happen?' And so you have another drink, and another. And then your glass is empty.” It’s flawless, delicious, interesting and I didn’t want my glass to empty. My true test of a beer is whether I’d buy a case of it... I immediately wanted to buy a slab of Monsieur Rock and drink the whole thing. And I wanted to phone my friends and tell them to do the same. For me, 2010 is notable as being the one where I discovered great lagers, whether Czech, German, English, Italian, American or beyond. Monsieur Rock ends my year with a perfect pint and a beautiful ode to the sublime Saaz hop. Here are three more entries to the Golden Pints – from my good mate Matt Stokes, John Clarke, regular blog reader and beer lover, and Will Briggs, who works at Beer Ritz and writes Ghost Drinker. My winners are here (although after a couple of bottles which I had over Christmas it might need updating...). Best Beer Twitterer: Oh, please….. In 2011 I’d most like to… get to Bruxellensis if the buggers run it again as promised. Food and Beer Pairing of the Year - Mikkeller Black Tie and Rocky Robins!! Open Category: - Best V.blogs - Stu from Crown Brewery for his food and beer videos - Love the guy. You know how you’ve scanned your local supermarket shelves so many times that you know exactly what beers are where... it means that when something new arrives it sits on that shelf like the brightest bauble on the Christmas tree shouting "look at me, you haven’t tried me before!" 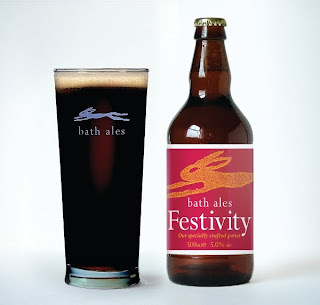 That's exactly what happened with Bath Ales’ Festivity. That tinsel-pink bottle label and orange hare jumped straight out at me. I walked past it the first time (after a quick read of the label, of course) only returning after a friend from university, James, said that it was one of his favourite beers at this time of year. I’m glad I did return. A seasonal porter, it’s almost opaque except for where the flashing Christmas tree lights just glimmer through at the edge of the glass. The bottle says rum, coffee and vanilla and, the power of suggestion aside, that’s what you get, plus a delicious depth of chocolate, the sort you’d get from an amazing milkshake. It’s full-bodied, smooth and ever-so tasty – cocoa, a little brown sugar and vanilla but it never gets over-sweet (not that it stayed in my glass long enough to notice), balanced by a savouriness and a subtle, nutty-earthy bitterness. Yummy is definitely the right word to use for this beer as there’s a silky unctuousness to it with a chocolate richness tempered by moreish glugability. It’s the nicest bottled beer I’ve had from the supermarket in ages and definitely the best Christmas-themed beer I’ve had this year. I’m going back to Waitrose today to buy a couple more. Anyone had this yet? Any other festive seasonal bottles worth drinking or are they mostly just gimmicky and as disappointing as an empty stocking on Christmas Day? Best UK Bottled Beer: The Nominees: Moor Revival; Thornbridge Halcyon; Old King Henry Special Reserve; Kernel Centennial Pale Ale; Kernel Export Stout; Marble Chocolate Dubbel. The Winner: Moor Revival (4% bottled pale ales can be terrible; this one is fantastic). Best Overseas Draught Beer: The Nominees: Bear Republic Racer 5 at the brewpub and at the Toad in the Hole, Santa Rosa; AleSmith Barrel-Aged Speedway Stout; IV Saison in Moeder Lambic; Pilsner Urquell in the cellars under the brewery; Killer Harvest at Mountain Sun. The Winner: Bear Republic Racer 5. Best Overseas Bottled Beer: The Nominees: Birrificio Italiano Tipopils; Struise Black Mes; Bells HopSlam; De Molen Lood & Oud Ijzer; AleSmith Speedway Stout; 3 Fonteinen Schaerbeekse Kriek. The Winner: Birrificio Italiano Tipopils. Best Overall Beer: Bear Republic Racer 5. For the theatre of the beer I drank in the cellars, Pilsner Urquell is runner-up. 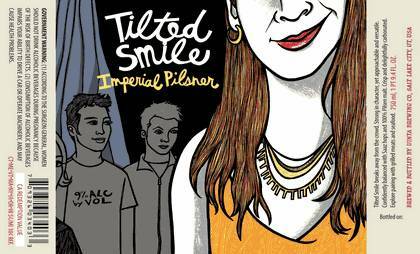 Best Pumpclip or Label: Uinta Crooked Line Tilted Smile Imperial Pilsner. Loved the beer, too. 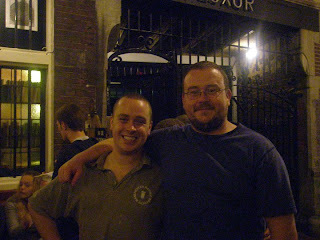 Best Overseas Brewery: Answering this one as the best I visited... Cantillon. Just the most handsome brewery with magic in the air. Pub/Bar of the Year: Of all the beer bars, in all the world... the Euston Tap takes it this year. It’s a newcomer but it’s a great place with an excellent mix of beers and somewhere that’s exciting and that I’ll spend a lot of time in 2011. Honorable mentions to Cask Pub and Kitchen, The Rake (because I’ve drunk there more than anywhere else), Zly Casy in Prague and Moeder Lambic in Brussels. Beer Festival of the Year: Planet Thanet is the one I also look forward to above all the others (except GBBF, of course). Supermarket of the Year: Waitrose. Independent Retailer of the Year: The Bottle Shop in Canterbury. It only opened in November but they’ve got a great selection in a cool location in The Goods Shed. They also do some 9 pint kegs of interesting beer. Definitely one to watch (and visit) in 2011! Best Beer Book or Magazine: Not a beer book, but still relevant – The Flavour Thesaurus by Niki Segnit. Just a brilliant book which made me gasp and coo in excitement and ache in joy and wonder at the turn of each page. I finished the last page and started again. Best Beer Blog or Website: Stuart Howe’s blog is an unmissable read. I also really enjoy Beer.Birra.Bier, which has fast become a favourite of mine – engaging and very well written. Best Brewery Online: BrewDog do it well and I think Thornbridge have stepped it up recently, particularly on facebook. Food and Beer Pairing of the Year: Little fried fish, squeeze of lemon, pint of ice cold Mythos, enjoyed while sitting on the beach as the sun sets. My idea of perfection. In 2011 I’d Most Like To…: Drink even more good beer, learn more about wine and spirits (and drink more of them, too), brew some beer, drink in some different countries, see more bloggers and breweries collaborating and see lots of people attend the Beer Bloggers Conference! Open Category: Best Canned Beer: Oskar Blues Ten Fidy. It’s really tough to try and fill these in but it brings back so many good memories of a great year of drinking. If anyone wants to take part then paste it in below (or on Andy’s blog) or email me (markdredge@gmail.com) and I’ll post a few of them in one blog – I’ve already got some to go. Lots have already given their winners here or at Beer Reviews. Here’s a beer description; what’s the style? "Dark chocolate, coffee, berry fruit, vanilla and coconut; smooth and full bodied, strong, lots more chocolate, roast bitterness, boozy bourbon, vanilla..."
Now this one: "Grapefruit, orange pith, tropical fruit, caramel sweetness; a mouthful and it’s sweet first, then fruity followed by a bang of bitterness which clings to the tongue..."
Both are fairly simple, generic examples of tasting notes. The first is a barrel-aged imperial stout and the second is an IPA, right? 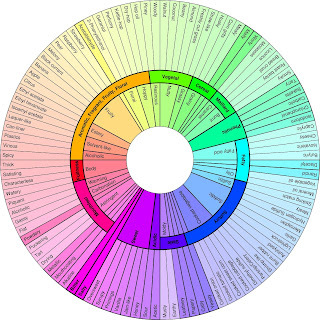 But, in real terms, do these beers actually taste like the flavours described in them? In other words, does the flavour in IPA actually taste like a segment of orange or grapefruit? And can you recreate the flavour of beer using real ingredients? Here is some beer on toast. Also known as beer canapés. Or deconstructed beer. There’s an American IPA, a dubbel and a barrel-aged imperial stout. The IPA is golden toast topped with caramel, piled above are oranges, satsumas, grapefruit, mango and some pith from each for bitterness. The dubbel is lightly toasted bread, tea-soaked raisins, a little ground pepper, mixed spices and some milk and dark chocolate. The imperial stout is made from burnt toast, dark and milk chocolate, cocoa, vanilla extract, toasted nuts, a few drops of bourbon, a flake of salt and some coffee. What I’m interested in is how representative of real flavours the things we write in our notepads (or the things we register in our mind’s palate) when we drink something actually are. Tasting notes are reductive. An IPA isn’t just oranges, grapefruit, mango and some indiscernible floral; it’s a lot more than that, made up by the unique coming together of its ingredients, and these flavours are easy to scribble down and give an idea of what the beer is like when we drink it. 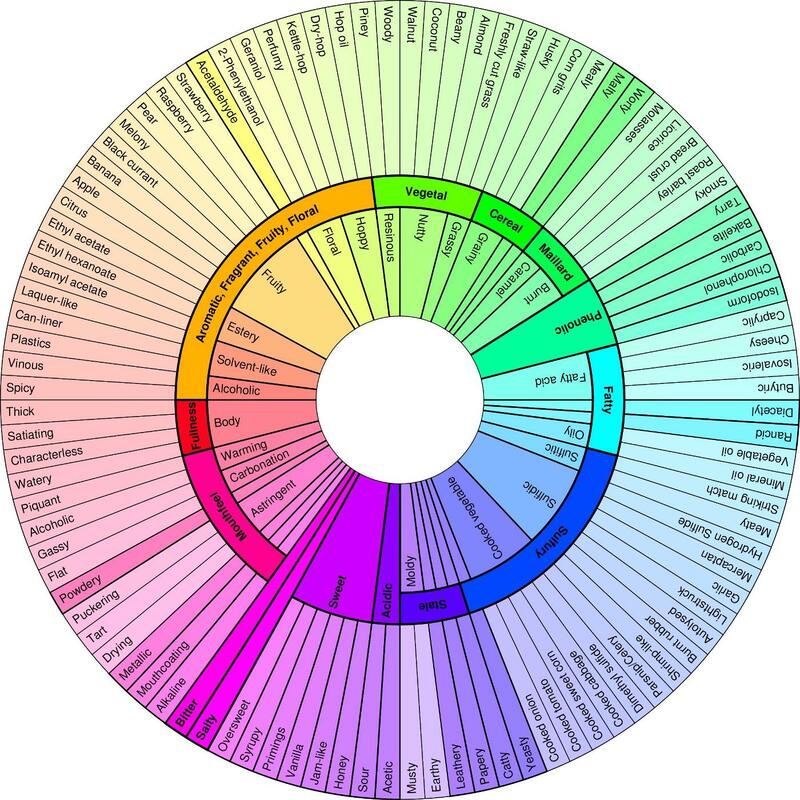 It’s not about tasting notes; this is a sideways glance at flavour, perception and how we describe (or think about) the two. Beyond this it’s about understanding flavours and what they actually taste like: is it coffee or dark chocolate; chicory or botanic bitterness; mango or papaya; crackers or brioche; lemon juice or vinegar (see: Gary Vaynerchuk). It’s also a fun experiment I wanted to try out. From this test, deconstructing beers to their discernible flavours does not create the same effect on the plate as it does in the glass. However, especially in the case of the stout and the dubbel, it does make for delicious beer canapés! “2011 is going to be a big year for us at Thornbridge,” says Simon Webster, director of the brewery, “and as we expanded the brew team it was key that we brought in the correct people.” Thornbridge have recently added Rob Lovatt, previously from Meantime, and Coalan Vaughan, previously from Little Creatures in Australia, and now they’ve added another name... Dominic Driscoll from Marble Brewery. This image is here to allow a pause for thought. The logo also works perfectly upside-down! Best of luck to Dominic. 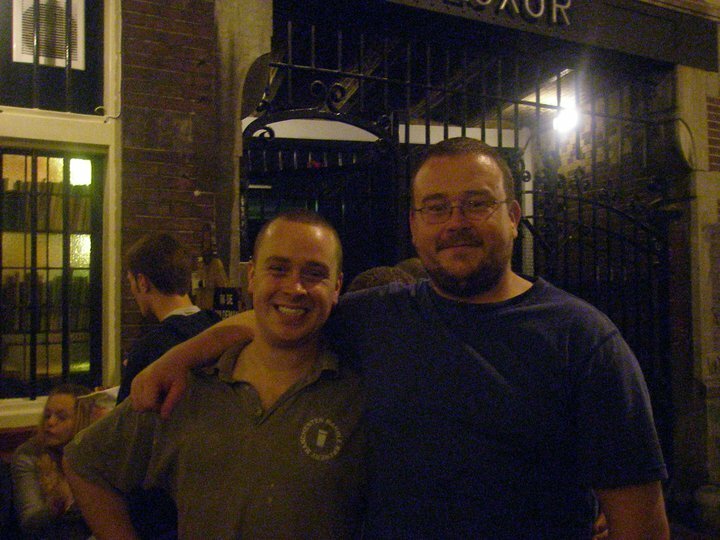 He’s a great guy and will do great things at Thornbridge, just like he did at Marble. Imagine Wayne Rooney left Manchester United and joined Chelsea... This is big news, right? Christmas Day. A day filled with presents, family, food and beer. A day when my favourite meal of the year is served. A day when an appropriate beer is needed to go with the meal. A day when it’s fine to open a bottle of something nice at 9am and carry on going straight through to passing out in the evening. A day to look forward to each year. Breakfast is for coffee stout. Something tongue-coating and thick, rich and warming. Any Mikkeller Beer Geek will do the job and set you up for a day of fun. Between breakfast and dinner is a free-for-all before the turkey comes out and gets carved beside a vegetable mountain. Fuller’s Vintage 2010. A fruity-nuttiness plays with a dry bitterness and plenty of malt depth to deal with whatever your fork brings. Any other Vintage would also work very well but there’s something nice about having the 2010 before the year is out (this Vintage is also ready to go right now). Chimay Blue. This is what I had last year and it’s a winner. Dried fruit with hints of festive spice and an uplifting carbonation. It works so well and the beer’s available in Waitrose so easy to get. Adnams Sole Bay. A big, fancy bottle, handsome on the table and something a little different. I haven’t tried it yet but I’ve got one in waiting and it sounds like a great beer to try with dinner – Belgian-style, little spice, fruity esters, Nelson Sauvin hops. Goose Island Sofie. One of the Belgian Goose Island beers, this is 6.5% and aged in wine barrels with orange peel so what you get is a dry, almost-tart beer with a big depth from the orange but also vanilla and body from the barrel it’s matured in. It’s the white wine alternative; it’s also a great beer. Marble Chocolate Dubbel. What a beer. Spicy yeast, lots of chocolate, lots of body to chase down those vegetables. A richer, darker choice but a good one if you’ve got a bottle hanging around and fancy something different. I don’t do beer with Christmas pudding. By that stage I’m more stuffed than the turkey was two hours earlier. Later in the day the bottles come back out again, but this year I have no idea what and I’ll be grabbing them depending on what I fancy. Beers for the turkey: what have you got? And do you have a breakfast beer planned in? 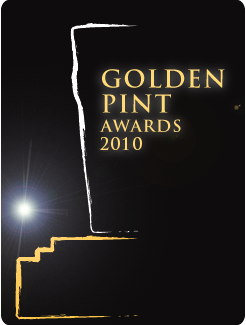 The 2009 Golden Pint Awards were a success so we have decided we'd have some fun with them again this year. It couldn't be simpler, just fill in your answers to the categories below. You can do this in the comments on someone’s blog post, write them in your own blog or email them to Andy or me and we’ll post them for you. Do it any time between now and New Year's Eve. Feel free to do a runner-up and a winner for each category (or some honourable mentions) and link to blog posts if you’ve written about winners before. For the open category you can choose whatever you want: it could be bargain of the year, night out of the year, barman of the year, cooking lager of the year, best beer photo, worst beer, anything you want. If there are any categories that you don’t want to give a winner for then just skip it. It’s a bit of fun to see out the end of 2010 with a few nominations of what’s been the best of beer from the previous year. And thanks again to Rob from I Might Have a Glass of Beer for the logo. I've written a piece for the Guardian’s Word of Mouth about some of the more unusual ingredients used in beer around the world, including jelly fish, saliva, weasel poo and tomatoes... Here’s the full post. The piece was written as a double act to go with one about ancient ingredients and their current uses, which can be seen here. What’s the most unusual ingredient you’ve tasted in a beer?! This chilli is like all the other chillies out there, only it’s much better. It’s made with a bottle of imperial stout and loaded with fresh chilli peppers, including a couple of searing scotch bonnets, hence the Imperial name it’s been given. Looking through recipes online, a number are cooked with cans of Budweiser (seriously) and occasionally a slug of bourbon. Taking this up a few levels of awesome led me straight to a chocolatey, full-on imperial stout aged in whisky barrels – BrewDog’s Paradox Isle of Arran (an extra step up would lead you to adding Tokyo*). The beer adds depth, richness and a sweetness that can’t be added from elsewhere in the food world. Just be careful not to get a stout that’s too bitter as the last thing you want is a loser-takes-all battle between Scoville and Lupulin. No recipe for this, just a list of ingredients laid out around the kitchen like a flat-pack cupboard ready to be assembled without the instructions. The only important information: add the beer after the tomatoes but before the stock (you don’t want too much liquid and it’s better to have more beer) and cook it for a few hours in the oven, if you can. This serves about four, even though I was cooking for one. Pork mince (about 400g). Two big onions. Finely chopped carrot. Four cloves of garlic. Lots of fresh chillis (I also added chopped scotch bonnet, plus a whole scotch bonnet to the pot). Paprika and smoked paprika. Turmeric and cumin. Salt, pepper and sugar/honey. Tomato puree. Tinned tomatoes (maybe two tins). A bottle of imperial stout (less a little for the chef). Beef stock. Kidney beans. It’s worth cooking this for hours rather than minutes. I cooked mine for two hours, removed it from the oven for two hours and then cooked for another hour before serving. It was the most delicious chilli I’ve cooked which I can only credit to the beer adding a chocolate and booze depth that worked so well against the different levels of spice and heat. It also works really well with a beer but go for something dark and smooth like an oatmeal stout or a milk stout, something that perfectly fits the deep tomato and savoury flavours but has a cooling quality (I served mine with Meantime Chocolate but it didn't quite have enough body to hold it all together - the flavour worked well though). Chilli: How do you make yours? Beer in it, with it, neither or both? Snowed in and cabin fever approaching dangerously fast, I needed something to do before Lauren’s five-minute weather updates drove me to insanity (“It’s still snowing... It’s still snowing... It’s snowing a bit harder now... Oh, look at those icicles... Still snowing...”). I decided that I needed to occupy myself in the kitchen and to make it more interesting I tasked myself to cook with beer. A few inspiration-finding flicks through recipe books later and I was ready to bake some Barley Wine Cupcakes. The idea was a combination of inspirations: rum and raisin, warming and rich winter beer, the rise in baking beer bloggers and brewers and the Hummingbird Bakery (who make cakes so good that I had one and immediately bought their cookery book). For the beer I chose Nils Oscar Barley Wine because it was pretty much all I had in the cupboard that would work... thankfully, it was the perfect choice given its raisin, booze and bread sweetness and a mellow green bitterness (I nearly used a bottle of BrewDog Paradox Isle of Arran and soaked the raisins in whisky, but then decided to use the Paradox elsewhere...). Something like Fuller’s Golden Pride or Robinson’s Old Tom would also work well. Beer gets into the cakes in three ways: in the sponge, in the beer-soaked raisins and in the icing. It also leaves you half a glass, which is important. Drown a couple of handfuls of raisins in beer so that they are just submerged. Leave for around an hour and then drain well before adding to the cake mix. With the icing, just add it to loosen the mix and give a little extra beer kick. The finished cakes were the best I’ve ever made, which is probably down to the Hummingbird recipe than the beer, but I think the beer still deserves credit. They are light and lovely with a delicious butter icing on top and loaded with little bursts of chewy-sweet raisin. The true test of a beer recipe is if Lauren (who hates the taste of beer) will eat it... she loved them. It’s easily adaptable to other beers, too, or you can leave out the raisins or replace them with something else (cherries, blueberries, chocolate). Stout (or, even better, imperial stout) is an ideal choice to use instead of barley wine and the recipe can be adapted to add cocoa; I’d like to try it with a sweetened cherry beer; a Belgian dubbel or quad would be good, I’m also tempted by a really fruity IPA but would want one that’s not too bitter. Oven to 170C. Mix the dry stuff with the butter in an electric mixer. Gradually pour in the milk and half the beer. Separately mix the egg, vanilla extract and the rest of the beer. Add this to the flour mixture and continue to beat together. Add the raisins, draining off the beer and discarding, and stir through. Spoon into baking cases until two-thirds full. Bake for 20-25 minutes. Once cooked, allow to cool before adding the frosting. To make the frosting, whisk (electrically, if possible) icing sugar and butter until well combined. Add vanilla extract and mix. Gradually add little splashes of the beer until the icing is the desired thickness (really thick) and then beat until light and fluffy, ‘at least 5 minutes’ the book says. Spread the icing on and EAT. What other beer cakes could work? P.S. This is my 400th blog post!